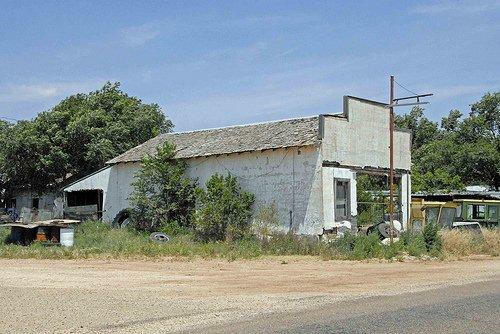 In its heyday sixty years ago in the late 1940s, Draw, Texas was a bustling, if not exactly thriving, little village of perhaps 200 people. It boasted two general stores, a blacksmith shop, one or two cafes (depending on the season of the year), a cotton gin, a small lumberyard, a Methodist church, a large six-room redbrick schoolhouse with an auditorium/gymnasium, and at least a dozen proper residential buildings, along with various lesser dwellings -- railroad boxcars and a tin shanty or two -- that housed gin workers and itinerants. Both general stores also doubled as gas stations and carried a stock of hardware goods, livestock feed, and small farm implements. To one was attached an ice house, for the summertime storage (but not manufacture) of block ice, which was transported from the ice plant in Tahoka. Later a second gin was built, adjacent to the first and operated by the same company, and in the fall ginning sometimes went on twenty-four hours a day for several months, from September until December. In those years of bumper cotton crops in the late 1940s, one or another itinerant tent movie operations appeared at the beginning of the harvest season and set up on some lot near the gin, showing old cowboy movies and catering to both locals and the hordes of Mexican-American families who flocked into the community to pick cotton each fall. Today, Draw is a ghost town. The gins and all the other businesses (and many houses) are gone; perhaps a dozen people live there, mostly in trailers scattered among the ruins. For many years, I felt sure that the origins of Draw were lost in the mists of history. It was never incorporated or ever big enough to support (or need) a newspaper or directory. 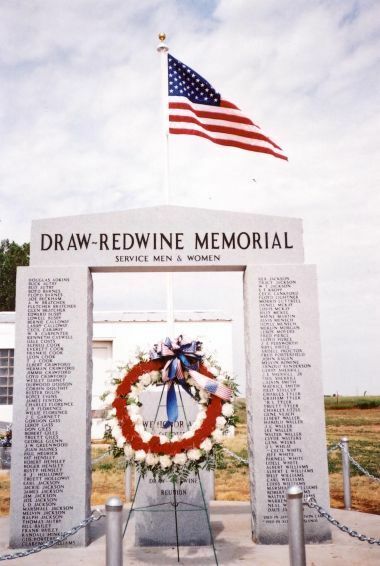 In light of the general settlement pattern on the High Plains, I simply assumed that it had its beginnings around the time of World War I, and that anyone who might know its history was long dead. I was wrong on both counts. What then must the first settlers have found when a few scattered families began to arrive around the turn of the 20th century? I asked that question of my dear friend Fern Barnes, who has lived there most of her eighty years. She said “Grass and rocks.” (It surely hadn’t changed much when her familiy moved there in 1926.) To grass and rocks, one can add a fairly thick sprinkling of mesquite trees -- although, to borrow what a Faulkner character once said of willow trees, “a mesquite ain’t a tree, it’s a weed.” In my time, mesquites were mostly confined to farmers’ pasture lands and the Double U ranch not far away. With the arrival of the first settlers, arable land was soon “broken out” and put into cultivation for cotton and maize. I grew up with the notion -- now apparently erroneous -- that the high plains of Texas were originally covered in grass so tall that the Spanish explorers, to find their way in and out, had to mark their routes with high wooden poles -- the fabled Llano Estacado, or Staked Plain. Now my friend Andy Wilkinson, who is an authority on all things West Texan, tells me that it was a mistake. “Estacado,” it seems, was a misspelling of “Estancado,” which means merely “stockaded,” an allusion to the high vertical walls of the Caprock when approached from the lowlands to the east. Besides, as Andy rightly points out, where would the Spanish have found wood for stakes? Except for the scrubby native mesquites, the Plains were essentially treeless until settlers came and planted elms and cottonwoods and such. 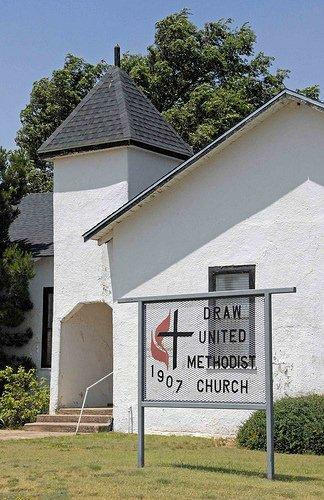 The earliest evidence of Draw’s existence comes not from contemporaneous records but from the memories of those who, fifty years later, contributed to a history of the Methodist Church there. As early as 1901, there existed a small building used as a school house and located some one and a half miles northwest of the present location of Draw. About 1904, this building was moved to a site three and a half miles northeast of present Draw and became known as “Moore’s Draw School House,” apparently taking its name from a geographical feature and the otherwise unknown settler named Moore (possibly spelled “Mooar”) who was identified with it. How “Moore’s Draw” was shortened and moved to its present location is unknown; one can only assume that soon afterwards there were the stirrings of some sort of commercial activity at the crossroads of what are now the small highways designated FM (Farm-to-Market) 213 and 1054, and those who used “Moore’s Draw School House” as both school and church decided that was the place to be. Obviously, the shorter version of the name followed along. In any event, a small one-room school house was erected there in the fall and winter of 1906-1907 (the name was now simply “Draw School House”). It also served as a meeting place for various religious denominations, the most prominent and active of which were the Methodists. In March 1907, a Methodist Church was formally organized, with seven charter members, five of whom were Mr. and Mrs. W. A. Waller and their three daughters. The others were Mrs. J. N. (“Kittie”) LeMond and Mrs. R. A. Duckworth. Very soon other newly-arriving settlers increased their ranks: the families of J. W. Luttrell, D. A. Shook, and D. N. Sewell, among others. Draw, Texas, at that time was something less than a Wide Place in the Road, as it was sometimes called. On the east side of the road [now Farm Road 1054] was Clarence Jackson’s grocery store. Behind the store was the house he and his family lived in. 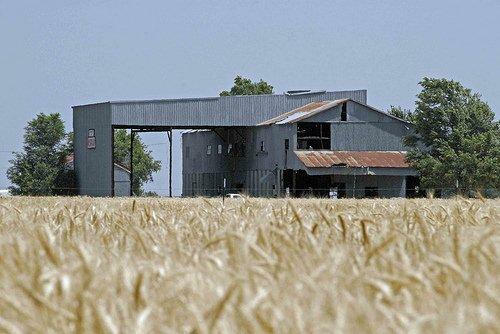 And at some distance away [to the south], the cotton gin. On the west side was the John Berry house. Further south was the Methodist Church with its parsonage, and beyond those the school house. When we arrived at Draw it was “The Store.” No one ever said, “We’re going to Draw.” It was “to The Store,” which stood on the edge of a draw, whence the name. The draw was no more than a large shallow depression in the flat plain. This was the Llano Estacado, where the Spanish explorer found nothing he wanted except sticks to mark his way out. The Store owed its existence to the presence of the cotton gin, and the fact that it was twelve miles to either of the two towns [O’Donnell and Tahoka] in Lynn County. Bruce was writing more than sixty years after he left the community, during which time he had returned on only two or three occasions. While I am grateful to him for that explanation of the name, I have to take some issue with it, or at least attempt a fuller explanation. I know of nothing even vaguely resembling a legitimate “draw” which The Store might have stood on the edge of, although Bruce was correct in describing it as “more than a shallow depression in the flat plain.” The depression was (is) somewhat oblong, roughly a mile and a quarter north to south and three-quarters of a mile east to west. Rather than standing on the “edge” of this would-be draw, Jackson’s store and all the other buildings that would eventually make up Draw were in fact situated rather near center of the depression. There is a crossroad just north of where The Store stood, and the roads leading away in all four directions pass up a slight rise. I believe we thought of them as “hills” when I was a boy but they would be hills only to plains dwellers who never saw anything that could properly be called a hill. Named after the nearby canyon called Mooar's Draw, the community has always been under populated. Earlier figures aren’t available, but the 1933 count was a mere 25 residents. Somehow, the town gained population during the Great Depression, reporting 100 for the 1940 census. It remained at 100 through 1960 but dropped to just 35 in 1970. From 1980 through 2000 it reported 39 residents.